Lots of folks saw a vaguely familiar airplane at the Midwest LSA Expo 2010... but, like myself, we looked and looked again and couldn't quite place the airplane. It turns out what fooled all of us initially was the installation of a 120-hp Jabiru 3300 under a new more aggressive cowling. Flying this airplane at the event, I came away a believer. I've always loved the S-19 (like most Rans models) and with this smooth-running powerplant, I found even more to enjoy. Come hear more details in our video. Lots of folks saw a vaguely familiar airplane at the Midwest LSA Expo 2010… but, like myself, we looked and looked again and couldn’t quite place the airplane. It turns out what fooled all of us initially was the installation of a 120-hp Jabiru 3300 under a new more aggressive cowling. Flying this airplane at the event, I came away a believer. I’ve always loved the S-19 (like most Rans models) and with this smooth-running powerplant, I found even more to enjoy. Come hear more details in our video. One of the sweetest flying Light-Sport Aircraft is the S-19 Venterra, the third ASTM-standards-meeting LSA from longtime kit producer, Rans. Available in kit or ready-to-fly form, S-19 is a low wing all-metal side-by-side design that will please any owner but can also work well as a flight school trainer. Designer Randy Schlitter has developed a strong and loyal following for his creations, of which this is (you guessed it) #19. Rans makes the S-19 kit; Jabiru provides the "go" for this one. Pete Krotje (L) and Mark Stauffer remove the cowling for our camera. Six cylinders of gleaming power provide 120 horsepower. Pilots seem to love more power. All other things being equal, a more potent engine is preferred to one with less power. Pilots also like sweet-handling airplanes. So, put 20 more horses in front of the S-19 Venterra and you've really got something. *** At the recent Mt. Vernon Midwest LSA Expo, I got to fly with Mark Stauffer in the Rans S-19 Venterra powered by the 120-hp Jabiru 3300. Saturday was beautiful and a great day for flying, but it wasn't just the agreeable weather that caused me to land (quite well, thank you) with a big smile on my face. This combo is darn near perfect, in my opinion. Now, I'm also a fan of Rotax's 912 series, but this six cylinder Jabiru engine was one of the few experiences I've had where the powerplant ran like the proverbial sewing machine. That comparison is often made but not always entirely factual. *** We flew slowly, down into the high 30 knot range and we flew fast, right up to the speed limit of LSA. Sweet throughout! At 2,850 rpm — where Jabiru establishes their maximum continuous power setting — we clipped along at a true airspeed of 120 knots at 4,500 feet MSL. You could consume more fuel and go somewhat faster (legally, since it's above max continuous) but why would you? The 3300 Jabiru purred like a contented kitty and made minimal noise and almost no vibration. I can't recall all the LSA flights I've made with different powerplants, but this had to be one of the very smoothest. 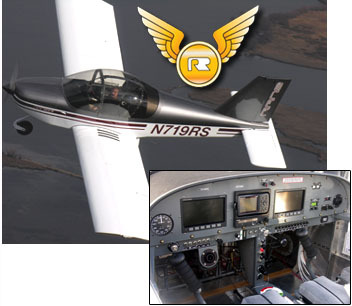 *** Jabiru USA bought the S-19 ("at full retail") from Rans to engineer the firewall-forward installation. The Shelbyville, Tennessee company makes a firewall-forward kit (FFK) for Zenith aircraft (CH-601, -650, -701, -750) plus other Rans models. With their FFK Jabiru USA supplies everything forward of the firewall except the nosewheel including a gutsy cowling modeled after the Arion Lightning also made in Shelbyville. *** Regular Rans S-19 factory pilot Tracy Standish put the 3300-powered S-19 through its paces and came away duly impressed, she said. Coming from a talented pilot of several Rans models, this means more than my enthusiasm. Tracy flew a Rotax-powered S-19 to the Midwest LSA Expo so her ability to compare was also better. *** After a few more hours of evaluation, Jabiru USA will sell the S-19 (as an amateur-built kit) and move on to other projects. If you want a terrific example of a Light-Sport Aircraft, you better call Jabiru USA now. Pilots seem to love more power. All other things being equal, a more potent engine is preferred to one with less power. Pilots also like sweet-handling airplanes. So, put 20 more horses in front of the S-19 Venterra and you’ve really got something. *** At the recent Mt. Vernon Midwest LSA Expo, I got to fly with Mark Stauffer in the Rans S-19 Venterra powered by the 120-hp Jabiru 3300. Saturday was beautiful and a great day for flying, but it wasn’t just the agreeable weather that caused me to land (quite well, thank you) with a big smile on my face. This combo is darn near perfect, in my opinion. Now, I’m also a fan of Rotax’s 912 series, but this six cylinder Jabiru engine was one of the few experiences I’ve had where the powerplant ran like the proverbial sewing machine. That comparison is often made but not always entirely factual. 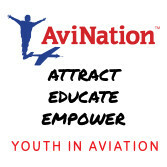 Top Guns -- Since January 2008, or over the last 20 months, the FAA registration leaders are -- in order: Remos; Flight Design; (tie) Tecnam and Czech Sport Aircraft; Jabiru, American Legend; CubCrafters; AMD; Aeropro (Aerotrek); TL Ultralight (Sting); and Evektor. 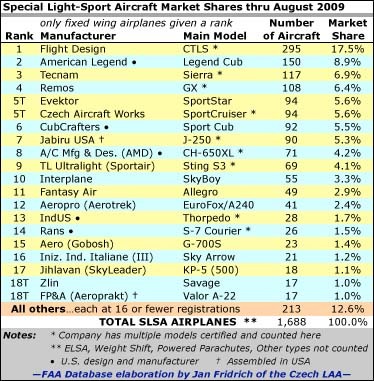 These 11 brands account for 72% of all FAA registrations. As always, my thanks to Jan Fridrich for the considerable effort it takes to sift through FAA's database. As the challenging year for aircraft sales grinds on, Light-Sport Aircraft continue to hold their own. In tough times, when cash is tight, small enterprises may fare better than large companies. Their low expense structures, modestly compensated managers and employees, and lean manufacturing -- as allowed by industry-standards certification -- become strengths. *** But we see another quality. The half-million-plus general aviation pilots are more accepting of LSA today than three years ago. Organizations like AOPA are more fully embracing LSA, because their members are calling to ask questions. 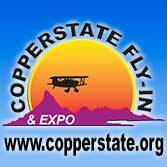 (Watch for a surprise LSA announcement at AOPA's Aviation Summit in about a month!) GA pilots make up most buyers of LSA and those aviators now recognize the brands and have begun to acquire faith in companies certifying themselves (though many are still reserving judgement). *** Through August, a full month after AirVenture, the LSA fleet has grown to just under 1,700 fully-built aircraft not including ELSA kits or alternative aircraft like trikes and powered parachutes, nor any converted ultralights. The LSA market leaders have remained about the same and held their same positions (more info: chart). 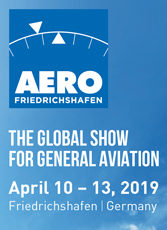 *** I see four up-and-comers to watch: Aerotrek (Aeropro); American producer, RANS; Gobosh (importing two airplanes); and Brazilian entry Paradise. In addition to the top-10 that hold three-quarters of the market, these four brands are working hard and moving up. In 2010, we'll begin to see Cessna numbers plus a few new entries. It stays exciting here at aviation's entry level. [UPDATE 10/7/09] CubCrafters identified additional SLSA not included in the accompanying chart. Such errors happen due to a large number of LSA models and the FAA database entry of them. According to better information, it appears CubCrafters has leapfrogged into the #5 slot, and the exclusive triple-digit club, with 100 total CubCrafters SLSA. As the challenging year for aircraft sales grinds on, Light-Sport Aircraft continue to hold their own. In tough times, when cash is tight, small enterprises may fare better than large companies. Their low expense structures, modestly compensated managers and employees, and lean manufacturing — as allowed by industry-standards certification — become strengths. *** But we see another quality. The half-million-plus general aviation pilots are more accepting of LSA today than three years ago. Organizations like AOPA are more fully embracing LSA, because their members are calling to ask questions. 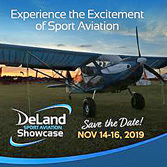 (Watch for a surprise LSA announcement at AOPA’s Aviation Summit in about a month!) 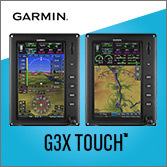 GA pilots make up most buyers of LSA and those aviators now recognize the brands and have begun to acquire faith in companies certifying themselves (though many are still reserving judgement). *** Through August, a full month after AirVenture, the LSA fleet has grown to just under 1,700 fully-built aircraft not including ELSA kits or alternative aircraft like trikes and powered parachutes, nor any converted ultralights. 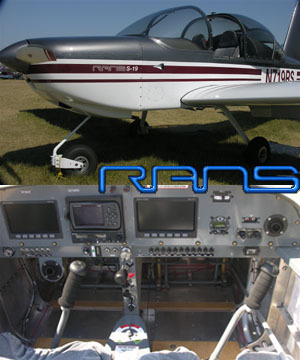 The RANS S-19LS joins the RANS S-7LS, shown with it at left, as two ready-to-fl y airplanes available from the Hays, Kansas, manufacturer. Kit versions of both aircraft are also available. Randy Schlitter, president of RANS and chief designer, has always given crash survivability and other safety factors high priority in his designs. The all-metal S-19LS has dual sticks, with hydraulic brakes standard on the left-side but available as an option for the right seat, which makes it a viable training aircraft. It's available with analog instruments or an all-glass panel, as shown here. 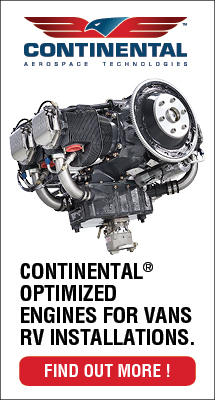 The S-19's standard powerplant is the Rotax 912S, but RANS will likely off er mounts for Jabiru and Lycoming engines. 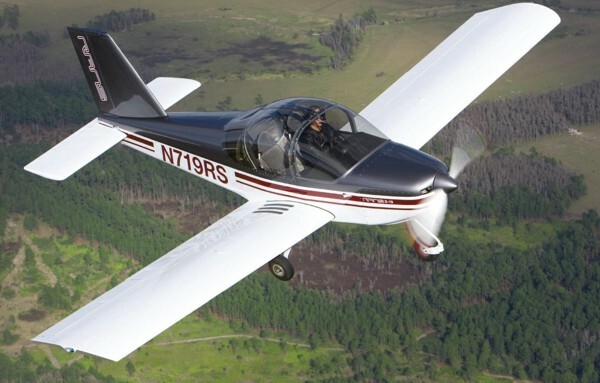 The Second SLSA from RANS RANS Inc. continues to be a significant player in the homebuilt aircraft market as one of the nation's largest kit airframe producers. In the last two years, Randy Schlitter, RANS' designer and CEO, added manufactured, ready-to-fly special light-sport aircraft (S-LSA) to his enterprise; the S-7LS is presently in production, and it will be joined by the S-19LS in 2008. The good news for EAA members interested in building one is that the new S-19 is also available in kit form. Manufacturing completely built aircraft under ASTM International standards is a diff erent work eff ort than kit manufacturing under amateur-built standards. Even so, several industry experts agree that RANS is a good candidate to succeed at such a multi-tasking eff ort. (Randy and his team already simultaneously run two companies, one for airplanes and another for recumbent bicycles.) RANS hopes to have the S-19LS manufactured model in production by fall 2008, for those who want to buy and fly. It was my pleasure to fly the new S-19LS, N719RS, on November 9, 2007, at Wittman Regional Airport in Oshkosh, Wisconsin, with RANS demo pilot Tracy Standish. NEW DESIGN The S-19 is an all-metal, constantchord low-wing relying heavily on CAD/CAM methods. "We never built a prototype; the first aircraft was production tooled and a proof of tooling and process," Randy explained. "The S-19 earned S-LSA approval on December 21, 2007, and delivery of the first S-19LS should begin in the fall of 2008. The S-19LS is the first all-new aircraft made and designed in the USA specifically for the light-sport category to receive S-LSA status since the ruling went into effect." The S-19 structure is a "monocoque" (stressed skin) design supported with internal bulkheads and stringers to maintain shape. The horizontal tail is a stabilator. A 100-hp Rotax 912ULS engine powers the S-19. "The 912S engine has proven itself reliable in years of operation. 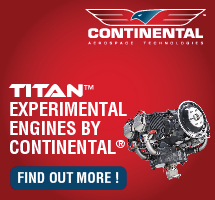 Other engine options will be explored, from Jabiru to Lycoming," Randy added. Wing spars are machined from a one-piece custom extrusion specially designed for this aircraft. The extrusion is tapered and shaped, and all holes are final sized in the machining process. Those building from kits will be pleased to note that only a few additional parts are attached with solid aircraft rivets to reinforce the root area and a short channel-type tip spar. The wing spars are factory assembled for each kit. The ailerons and stabilator are operated with push/pull tubes via bell cranks. Stainless steel cables control the rudder. Plastic, rotation-molded, 12-gallon fuel tanks are located in each wing. Because the tanks are mounted in a fuel bay just behind the wing spar, the entire leading edge of the wing must be deformed in a crash before the tank is affected. Safety is further enhanced by the relative outboard location of the tanks; they start 26 inches outboard from the cabin wall. This is not enough to create signifi- cant balance or inertia problems, but it puts additional space between the fuel and the occupants. Productionbuilt S-LSA models will feature integral "wet wing" style tanks in the same location, providing an hour of added range while shaving 18 pounds of empty weight. KIT-BUILDER FRIENDLY RANS says the S-19 kit was developed with the average homebuilder's experience level in mind. The airframe assembly requires very little tooling and no special equipment. No welding or fabrication of parts is required. A few components require simple fixtures for building, such as the vertical fin, stabilator, and rudder. These fixtures are included in every kit, and do not require extensive setup or a large space. The design of the S-19 also keeps service and maintenance in mind. "A number of well-placed removable inspection covers allow access to all critical components," Randy said. The company claims that building an S-19 will be a rewarding and fun project for the homebuilder, requiring a total time investment of 750 to 1,000 hours. High-quality blind rivets are used throughout the construction of the airframe, with the exception of the spars, which come assembled with solid rivets. This eases the building process significantly, allowing mostly single-person assembly. Blind rivets are an advanced form of construction popular among many designs. The fit and finish of the parts allows virtually jigless assembly resulting in a high quality structure, according to RANS. The S-19 may appear complicated and high in part count, but the company assures potential builders that "the well-machined components will assemble quickly, and with much lightness, due to the great care made in keeping things light." PILOT FRIENDLY As we performed our preflight cockpit check, I observed that the S-19 is equipped with a fuel control lever that allows left, right, or both settings. Tracy said she uses the control to keep the wings equally loaded. After she completed her review of the cockpit switches and instrumentation, we were ready to fly on a cool November day in Oshkosh. The S-19 features dual controls- two center sticks. Tracy advised that the standard takeoff technique is to deploy a notch of flaps, add full power, and lift the nose when able. Since the S-19 uses a castering nose wheel, pilots will find it easier to steer on the ground using the tailplane. When I asked Tracy for a rotation speed, she simply said, "I don't know. I just apply back pressure and let it fly off the runway." When I followed that instruction, the S-19 cooperated beautifully. Takeoff proved to be brisk in the dense fall air. RANS says the takeoff roll is 325 feet. Climb was medium for the category at around 750 feet per minute (fpm) observed. But this early S-19 may be a bit heavy, and additional prop tweaking may follow to reach the 900 fpm RANS publishes. Factory pilots said that they observed 900 to 1,000 fpm on most demo flights. When we set up for approach to landing, idle thrust at 2400 rpm yielded about a 500 fpm sink rate, perhaps a shade lower. The air was a bit bumpy with winds at 12 gusting to 16 knots. We landed on Runway 36 with winds 320 degrees at 16 knots. For landing, we used two notches of flaps. A third notch is available but is mostly used on the ground-to ease the step up onto the wing for entry into the aircraft. At two notches and holding a generous speed of 70 mph for most of the descent, landing proved uneventful. The S-19 shows plenty of control at slower speeds. PILOT COMFORT For extra ventilation, the S-19's canopy will open an inch while in flight. Having the canopy fully opened is possible but not recommended at this time, according to Tracy. However, visibility is excellent, even over the nose in climb attitude. Inside, occupants will enjoy a wide 43.5-inch cockpit, precisely 4 inches wider than the benchmark Cessna 172. RANS says headroom is ample for 6-foot, 4-inch pilots. Seats adjust fore and aft and feature a reclining adjustment. Baggage space is more than one might expect. The S-19 offers enough space to carry two folding bikes. This consideration reflects the "other Randy," the bicycle builder. Up to 70 pounds of baggage fits in a spacious, 13-cubic-foot compartment behind the seats. CATEGORY PERFORMER Away from Wittman Field, I saw climb at about 650 fpm at 100 mph, a good enroute climb speed with a lower nose attitude for enhanced visibility. I tried power-off stalls with flaps up and experienced a modest stall break at 46 to 47 mph indicated. With two notches of flaps deployed, this stall speed dropped to 41 mph indicated. When I started to perform poweron stalls, Tracy was careful to keep me focused on a centered ball. I had not done particularly well at using the Dynon electronic ball. A conventional, non-electronic slip/skid indicator was positioned right in front of me, and I did much better when using this instrument. The electronic ball moves around quicker and was less useful to me. We did departure, or power-on, stalls at about 5400 rpm, a power setting used for higher cruise speed. At this setting, the S-19 assumed a fairly steep deck angle, and I could discern stall in the low 40s; however, the airplane never broke. The electronic ball challenge arose again when I did my Dutch roll coordination exercises. Randy and Tracy-with far more time in the airplane than I-each feel the harmony between controls is good. I found the controls a bit on the sensitive side, though I was able to do Dutch rolls to 30-40 degrees with little problem. Accelerated stalls in each direction tended to roll to level, an excellent characteristic. A vibration was experienced at incipient stall in any condition, which gave a good indication that stall was near. It was not a loud stall horn, but if you pay attention, it was plenty of warning. Steep turns went well with the S-19 easily holding bank and altitude. Instead of using the Dynon bank indicator, I visually estimated a 60-degree bank angle. That I felt comfortable doing them to this steep angle is some testament to the S-19's stability profile. Later, I checked longitudinal stability by trimming to level flight and then lifting the nose and releasing. The S-19 did one descent to about 140 mph indicated and then leveled out, another impressive show of stability. I found yaw stability to be quite strong. There's enough vertical tail volume available to reduce adverse yaw. To feel the performance envelope within normal operations, I did fullpower speed runs upwind and downwind. When flying into the wind, the airspeed indicator showed 95 knots on the GPS. Turning with the wind, we saw 137 knots, for an average of 116 knots or 133 mph. Randy reported that he likes to run the S-19's Rotax at 5300-5400 rpm as his high cruise speed; 5600 is considered maximum level flight power. RANS will explore the Jabiru, or at least an engine mount for this Australian engine, even though Randy feels the Rotax works. "Despite recent price increases, the 912ULS is still the best choice for those wanting a legal LSA that will perform well just about anywhere you can legally fly an LSA in the USA." RANS also reported the S-19 has been tested to the standard of one turn left and right, and a bit beyond. Randy said that a one-and-a-half turn recovery is still crisp and can be snapped out within 45 degrees of input. "At present we are placarding the plane 'spins prohibited,'" said Randy. RANS will consider whether to allow spins later. SAFETY FEATURES RANS specifies several features that make the S-19 a safer machine to fly: Its seats feature special foam bottoms that should protect occupants in situations that generate up to an 18g impact, saving spinal injury. The S-19LS has an extra measure of stringers and bulkheads forming a crush zone to help absorb energy in the event of a frontal impact. RANS believes a sliding canopy is a safety feature, since one critical element of off-field landings in a low wing is the ability to exit the plane if it is upside down. A sliding canopy can be opened and locked prior to landing, providing an exit. Others agree sliding canopies are superior to flip-forward canopies for emergency egress, but most experts see high wings as the easiest to exit after mishap. The airplane's stability is a safety feature, Randy says. "The S-19's stability is another component of going beyond the standard, where no real call out other than positive recovery is required. The S-19LS will stabilize from a pitch diversion in less than two cycles. Rudder tending in the turn is not required." The S-19's four-point harness uses proper angles as specified in FAR Part 23, providing maximum security to protect occupants. As mentioned previously, the S-19's instrument panel and forward cowl design offer great visibility and also promote safety. In the event of a frontal impact, the occupants are less likely to impact against the instrument panel due to its low profile and it being as far forward as possible while still reachable for a person of average height. "There are no standards for interior layouts, but occupant safety has been a large inspiration of this design," Randy pointed out. Likewise, the S- 19LS' stick has a low profile, moving it forward of the probable zone where an occupant's head may travel in a high g, near vertical or frontal impact. Fuel location is important to safety, especially when considering fuel spill in a crash. To minimize this risk, RANS engineers placed the S- 19LS fuel tanks outboard in the wing panels, rather than close to the occupants. The tanks can withstand any fuel type, Randy said. Some composite tanks are sensitive to additives commonly found in auto fuels, and RANS feels many S-19LS owners will use auto fuels. Occupants also may feel more secure knowing a welded steel roll bar is located in front of them. The steel roll bar is supported with a brace to the forward cabin structure and is combined with a robustly supported cabin floor, forward fuselage, and center section structure to enhance crashworthiness. The roll bar should also assist in exiting the aircraft in the case of a rollover, an important factor in sliding canopy designs. Randy Schlitter is passionate about the team's safety effort. "The S-19LS is not merely an attempt to meet ASTM standards. It is the successful creation of a sport plane that exceeds the accepted standards," he said. RANS has put more than 200 hours of flight time on N719RS. "We are still impressed with the smooth, quiet, and spunky performance and handling of the S-19," Randy said. Those 200 weren't easy hours. The S-19 has flown over mountains four times, taking off at above 7,000-foot density altitude with maximum loads. This same S-19 has flown hundreds of demo flights. The first-article airplane has been subjected to detailed inspections for any signs of stress, cracking, and overloads, and it continues to pass without major issues. MADE IN THE USA Two-thirds of today's LSA fleet is made in Europe. Except for Cub- Crafters and American Legend, few U.S. designs command any signifi- cant market share. That could change with the S-19. As of the 2008 U.S. Sport Aviation Expo, the official introductory price of the fully built S- 19LS with analog instruments was set at $110,000, and $117,000 for the dual-glass-panel version. Randy expects the initial production rate will be modest. "We will ramp up over the next 12 months building several planes to develop the production process." RANS expects to complete 50 to 75 planes per year in one to three years. The company has been producing the high-wing, tandem-seat S-7LS since October 2005. If the price of the ready-to-fly S-19 sounds too steep for your budget, the kit may be just right. All kit components for the S-19 run approximately $25,000. 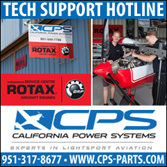 Adding the 100-hp Rotax 912S and a prop will bring the total to nearly $45,000. Instruments and finish will add another $5,000 to $10,000 (or more), totaling up to about half the ready-to-fly price. No matter whether the kit or production S-19 interests you, the result is a worthy addition to the RANS aircraft fleet. My guess is this airplane will be around for a long time. The Second SLSA from RANS RANS Inc. continues to be a significant player in the homebuilt aircraft market as one of the nation’s largest kit airframe producers. In the last two years, Randy Schlitter, RANS’ designer and CEO, added manufactured, ready-to-fly special light-sport aircraft (S-LSA) to his enterprise; the S-7LS is presently in production, and it will be joined by the S-19LS in 2008. The good news for EAA members interested in building one is that the new S-19 is also available in kit form. Manufacturing completely built aircraft under ASTM International standards is a diff erent work eff ort than kit manufacturing under amateur-built standards. Even so, several industry experts agree that RANS is a good candidate to succeed at such a multi-tasking eff ort. (Randy and his team already simultaneously run two companies, one for airplanes and another for recumbent bicycles.) 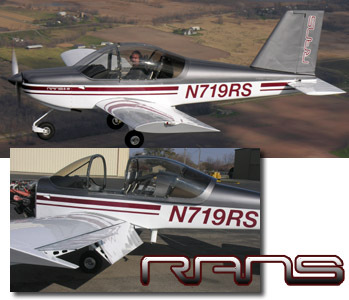 RANS hopes to have the S-19LS manufactured model in production by fall 2008, for those who want to buy and fly. Jim Younkin is the man behind TruTrak Flight Systems, a source for autopilot devices in recreational aircraft. He's also an experienced pilot of his RV-9 and other aircraft. Here is his report of the S-19. "I found myself comparing the S-19 with our RV-9, a highly regarded aircraft. The aileron response or feel is comparable to it. When slow flying at the edge of a stall, directional control is positive, and even in the stall it remained so. "The large flaps are very eff ective so as to permit a steep approach without excessive speed buildup. Finally, I was pleased to note that both the brake and a free-swivel nose gear were employed. This is much better in crosswinds than the combination of a hand brake and steerable nose gear found in most of the LSA I have flown. Another feature of value in the crosswind situation is that it has sufficient cross-control response (slip). "To sum it up, I would say I am inclined to compare it more with the RV-9 than other LSA aircraft I have flown." Jim Younkin is the man behind TruTrak Flight Systems, a source for autopilot devices in recreational aircraft. He’s also an experienced pilot of his RV-9 and other aircraft. Here is his report of the S-19. “I found myself comparing the S-19 with our RV-9, a highly regarded aircraft. The aileron response or feel is comparable to it. When slow flying at the edge of a stall, directional control is positive, and even in the stall it remained so. “The large flaps are very eff ective so as to permit a steep approach without excessive speed buildup. Finally, I was pleased to note that both the brake and a free-swivel nose gear were employed. This is much better in crosswinds than the combination of a hand brake and steerable nose gear found in most of the LSA I have flown. Another feature of value in the crosswind situation is that it has sufficient cross-control response (slip). The last one in under the wire, S-19LS concluded a productive 2007 year of SLSA approvals. Read about S-19LS safety. Rans will continue to offer an S-19 kit that you can get airborne for around $50,000. As we bid farewell to 2007, up popped one of America's top kit producers: Rans. During the year the industry reached number 65 in Special Light-Sport Aircraft approved. Randy Schlitter sent a note saying, "We achieved SLSA status for the S-19LS on December 21st." He added, "The S-19LS is the first all new aircraft made and designed in the USA specifically for the light sport category to receive SLSA status since the ruling went into effect." S-19LS relied heavily on CAD/CAM methods. "In fact we never built a prototype; the first aircraft was production tooled," continued Schlitter. *** S-19LS features the 100-hp Rotax 912ULS, an all-glass cockpit, and a $110,000 introductory price. Since late 2005, Rans has successfully produced the $85,000 S-7LS Courier. Delivery of the first S-19LSs should begin in 10 months, according to the company. If demand warrants, the Hays, Kansas company projects building 50 a year within 12 months, and possibly doubling output later. *** My experience flying the S-19 for a pilot report showed excellent flying qualities in all areas. Its conventionally-shaped Hershey Bar wing (no taper) exhibited forgiving qualities and landings were straightforward, suggesting a flight training role for the model. As we bid farewell to 2007, up popped one of America’s top kit producers: Rans. During the year the industry reached number 65 in Special Light-Sport Aircraft approved. Randy Schlitter sent a note saying, “We achieved SLSA status for the S-19LS on December 21st.” He added, “The S-19LS is the first all new aircraft made and designed in the USA specifically for the light sport category to receive SLSA status since the ruling went into effect.” S-19LS relied heavily on CAD/CAM methods. “In fact we never built a prototype; the first aircraft was production tooled,” continued Schlitter. 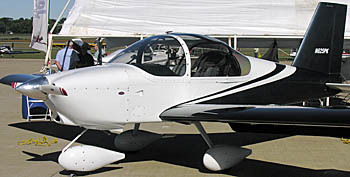 *** S-19LS features the 100-hp Rotax 912ULS, an all-glass cockpit, and a $110,000 introductory price. Since late 2005, Rans has successfully produced the $85,000 S-7LS Courier. Delivery of the first S-19LSs should begin in 10 months, according to the company. If demand warrants, the Hays, Kansas company projects building 50 a year within 12 months, and possibly doubling output later. Designer and company president Randy Schlitter flies the S-19 near Oshkosh. Note the cockpit headroom and the tailplane's large vertical area. Big ailerons make for cooperative handling and large flaps help deliver easy landings in S-19. See a video of it flying. Most light aircraft enthusiasts know Rans. One of America's leading builders the Hays, Kansas company has delivered more than 4,000 aircraft. Rans achieved Primary Category certification for their high wing tandem S-7 Courier in the 1990s. That program fizzled through no fault of Rans' but after meeting industry consensus (ASTM) standards their S-7LS again won approval as a Special Light-Sport Aircraft. *** Sales of the model ranks the company at #17...5th among U.S. builders. That position seems bound to rise when Rans adds the low wing side-by-side S-19 as a SLSA (so far it's been offered as a 51% kit). 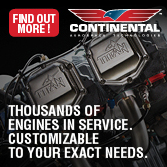 Look for their announcement at the Sebring Expo. *** Recently I attended EAA's Hall of Fame ceremony as designer Randy Schlitter was inducted into the Homebuilders category. Since he flew to Oshkosh I got the chance to fly his '19 for an article to appear in EAA's Sport Pilot. With 25 years of experience and a fleet of designs under his belt, Randy knows the task well. S-19 is a terrific flying machine. Control harmony is very good. Stability is excellent. Landing characteristics make for great touchdowns. Watch for my full pilot report early in 2008. Most light aircraft enthusiasts know Rans. One of America’s leading builders the Hays, Kansas company has delivered more than 4,000 aircraft. Rans achieved Primary Category certification for their high wing tandem S-7 Courier in the 1990s. That program fizzled through no fault of Rans’ but after meeting industry consensus (ASTM) standards their S-7LS again won approval as a Special Light-Sport Aircraft. *** Sales of the model ranks the company at #17…5th among U.S. builders. That position seems bound to rise when Rans adds the low wing side-by-side S-19 as a SLSA (so far it’s been offered as a 51% kit). 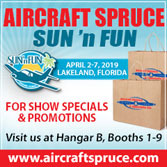 Look for their announcement at the Sebring Expo. *** Recently I attended EAA’s Hall of Fame ceremony as designer Randy Schlitter was inducted into the Homebuilders category. Since he flew to Oshkosh I got the chance to fly his ’19 for an article to appear in EAA’s Sport Pilot. A gorgeous gray, burgundy, and white paint job showcases the newest RANS. Glass screens dominated the show model. Preliminary specs: 75% cruise 128 mph (111 kts); Vne 150 mph; climb 900 fpm; payload 426 lbs; baggage 70-100 lbs; cabin width 43.5 in; fuel 2x12 gal. More details. Email RANS. Premise: In light sport aviation you never ignore RANS owner and designer Randy Schlitter. With his newly minted S-19, he's again proven the rule. A flying prototype from the Kansas builder was beautifully finished...a RANS airshow tradition. Compared to the G-700S SPLOGged earlier, S-19 is 70 pounds lighter thanks to "great care in keeping things light," said RANS (though it's heavier than predicted due to more durable materials). *** S-19 will be sold intially as a kit with components including Rotax 912S priced at about $43,000. Build time is estimated at 700-1,000 hours. "We plan to offer a certified SLSA," said Randy though he wouldn't speculate on when. S-19 first flew June 28th and "production flight testing should be complete sometime in August" though the company is ready to ship tail kits. Reporters will have to wait to fly S-19 but based on flying nearly every other RANS model, I expect superb handling. Premise: In light sport aviation you never ignore RANS owner and designer Randy Schlitter. With his newly minted S-19, he’s again proven the rule. A flying prototype from the Kansas builder was beautifully finished…a RANS airshow tradition. Compared to the G-700S SPLOGged earlier, S-19 is 70 pounds lighter thanks to “great care in keeping things light,” said RANS (though it’s heavier than predicted due to more durable materials). *** S-19 will be sold intially as a kit with components including Rotax 912S priced at about $43,000. Build time is estimated at 700-1,000 hours. “We plan to offer a certified SLSA,” said Randy though he wouldn’t speculate on when. S-19 first flew June 28th and “production flight testing should be complete sometime in August” though the company is ready to ship tail kits. Reporters will have to wait to fly S-19 but based on flying nearly every other RANS model, I expect superb handling.